Shadow was a shy cat, but she was also brave and diligent. When Farmer Don ruined her perfect hiding place in a tunnel under the hay, she didn’t give up. Shadow searched and searched for a new spot. It had to be just right for keeping her secret safe. 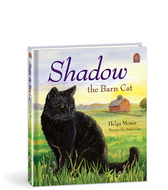 The fourth book in the Pleasant Valley Farm series. Item: 264643 ISBN: 9780878137824 Pages: 44 Size: 9.25 x 10.25 Binding: Hardcover Publisher: Christian Light Publications, Inc.